Koshys!! !, originally uploaded by dakini. 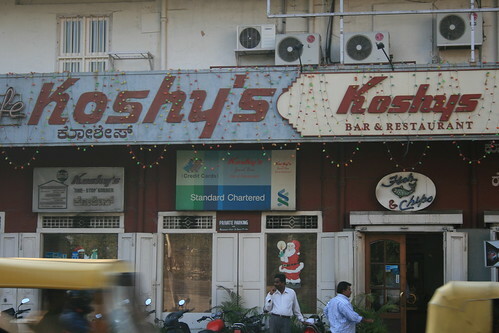 For lunch today I headed to MG Road to eat at Koshy's, a favorite old-skool Bangalore coffee shop/diner kind of place. I ate in the smoky old-man side, as always, rather than the prettified section. Can't say my fried chicken was very good, but the fresh lime soda was wonderful as always. One nice touch is that the waiter comes out with a plaid tablecloth and throws it over your table if you're ordering food. At first I got paranoid and wondered why I was getting this special treatment, but then I realized that of course all the men around me were just talking and smoking with coffee -- it was early. No tablecloths for them!